PEBBLE BEACH, Calif. - NHL officials approved a radical realignment plan Monday that will give the league four conferences instead of six divisions and guarantee home-and-home series among all teams. The Board of Governors authorized commissioner Gary Bettman to implement the proposal pending input from the NHL Players' Association. It could be put in place as early as next season. The new plan tried to address as many concerns of the teams as possible, from creating more equitable travel, to preserving rivalries, to promoting the game by having the biggest stars play in every city every season. "I think at the end of the day, everybody voted in terms of doing what the right thing was for the majority of teams and our fans and our competitiveness and what was fair," said Nashville general manager David Poile, whose team was a big advocate to change the current model. "I think everybody probably feels good about that today. I know I do." CBSSports.com's Brian Stubits says the plan has more positives than negatives. "The biggest consideration, time zones, was taken care of," Stubits writes. "Now the teams out West won't feel as big of a disadvantage as they do now. Despite having more teams in their new conferences, it was an easy sell for for the 15 teams that currently call the Western Conference home." Stubits adds: "The biggest problems I see? First is for the teams in the two eight-team conferences. They face longer odds than the other half of the league to make the postseason." The league considered two plans to accommodate Atlanta's move to Winnipeg this past summer. The first would have simply moved the Jets to the Western Conference's Central Division and either Detroit or Columbus to the Southeast in the Eastern Conference. But there were issues with that plan that kept compounding with each potential solution as other franchises wanted to use realignment to solve their concerns, as well. "The simple one wasn't as simple as it looked when you got done with it," Bettman said. The board opted to go with the more dramatic switch, creating four geographic conferences  two with eight teams and two with seven. The new format will increase overall travel in the regular season, especially for Eastern Conference teams who will now have more trips West. But it cuts down on travel for some Western teams, which was a critical issue for teams like Detroit, Dallas, Columbus and Nashville. "This is not a subject that everybody is going to get their first choice on," Bettman said. "What you try to do is come up with something that everybody can live with, get comfortable with and understands the value of. Because if you ask 30 clubs, you'd probably get 30 different solutions. That's what makes this a difficult process." Toronto general manager Brian Burke said he had concerns about the wear and tear the extra travel would have on his team but approved the plan when he was assured by the league that the schedule would be more efficient with every team playing in every city. "We try to vote with a league hat on when we can," he said. "Sometimes you have to vote with your team's interest in mind. There's times you can vote with the league hat on and that's what we tried to do." The third conference consists of eight teams in the Eastern and Central time zones: Detroit, Columbus, Nashville, St. Louis, Chicago, Minnesota, Dallas and Winnipeg. The fourth conference has eight teams in the Mountain and Pacific time zones: Los Angeles, Anaheim, Phoenix, San Jose, Vancouver, Calgary, Edmonton and Colorado. The conferences have not been named. "I think there were more than two or three teams not happy with the current situation," Columbus general manager Scott Howson said. "This was a compromise that really satisfies everybody to a large extent." The league was able to keep rivals Pittsburgh and Philadelphia in the same conference by grouping the two Florida teams with the three Canadian teams in the Eastern Conference, Boston and Buffalo. "We don't have much input as players but I'm sure that they've worked every possible situation and it's like with anything, it's not going to fit everybody perfect but Florida in January's not too bad," Ottawa captain Daniel Alfredsson following the Senators' 4-2 win over Tampa Bay. Teams will play home-and-home series against all nonconference teams and five or six games in their conference. The top four teams in each conference will make the playoffs, with the first two rounds consisting of solely intraconference matchups. Bettman said he will consult with general managers in the spring before deciding whether to reseed the playoffs in the third round or to have pre-determined matchups. Bettman said he liked the current format that he devised of six five-team divisions but that Winnipeg's move from Atlanta forced some change. He didn't take a stance on either proposal, but simply explained the pros and cons and allowed the teams to vote. There was about an hour of discussion, and representatives from about a dozen teams spoke before the plan was approved. Bettman said the NHLPA has expressed concerns about the new plan and that he will discuss it with union chief Donald Fehr before implementing it. 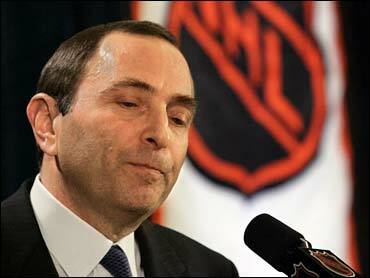 Bettman said the change doesn't need union approval, a stance the NHLPA contests. "Realignment requires an agreement between the league and the NHLPA," union spokesman Jonathan Weatherdon said. "'We look forward to continuing our discussions with the league regarding this matter."